Our review of the Toshiba A505D-S6987 brings us to an interesting crossroads. In recent years Toshiba has made a habit of producing fairly well-rounded and inexpensive notebooks—good values overall. The A505D we have on hand adds an AMD Turion II Ultra to the equation, specifically the M600 that exists near the top of AMD's mobile line (or did until the Phenom II refresh that's starting to show up in the marketplace was announced). 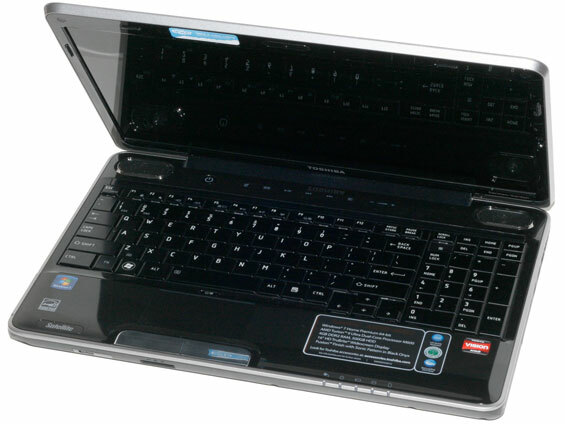 Ultimately, Toshiba means to bring a strong value-oriented mainstream notebook to market. Can it compete? The AMD Turion II Ultra M600 humming at the core of the A505D-S6987 is a K10.5-based processor, a mobile derivative of the desktop Athlon II line. It runs at a 2.4 GHz clock speed and has a combined total of 2MB of L2 cache—1MB per core. The Turion II should perform more than adequately; AMD's refined K10.5 architecture is typically able to produce performance clock-for-clock equivalent with Intel's first generation Conroe-based Core 2 Duo architecture, slightly behind the second generation Penryns. It's not going to run with the Core i3/i5 processors, but it should get the job done for most users and offer a fine value proposition. Attached to the Turion II's integrated memory controller is 4GB of DDR2-800 RAM. Consider this unit one of DDR2's last hurrahs; even Intel's Atom processors use DDR3 now, and AMD's most recent Danube/Nile refresh brings DDR3 support to the table as well. DDR2 and DDR3 have already reached price parity, and DDR3 is even starting to show up at slightly lower prices. Toshiba also packs a 500GB, 5400 RPM hard drive into the A505D—naturally, a Toshiba drive. The unit is rounded out by a Realtek wireless-n adapter and, as a nice value-add, a slot-loading DVD writer. The last thing Toshiba brings to the table is one of the benefits of using an AMD CPU—AMD's Mobility Radeon HD 4200 integrated graphics processor. While the Intel HD graphics embedded in Intel's dual-core i-Series Core processors has made great strides in bringing performance parity with AMD and NVIDIA (excepting NVIDIA's staggering GeForce 320M IGP in Apple's hardware), overall driver quality, stability, and performance is still largely in AMD's favor. Note that like the Acer 5542 we looked at recently, the A505D is a slightly older design and it is nearing EOL. However, there are plenty of laptops sporting the now outdated M-series AMD processors, and we expect to see a lot of these laptops on sale in the coming months. The original $800 MSRP is far too much, and even $650 is more than most would be willing to pay, but forgetting price for a minute it's still useful to see what the M600 laptops have to offer. What's more, we just received the new Toshiba A665 for testing (literally—the FedEx guy came by 15 minutes ago! ), and it updates the A505D in some interesting ways, so think of this review as a springboard into the A665 next week. I agree, but it does help set the stage for the next review, plus there are lots of Tigris laptops floating around. They perform well enough and often can be had for a song, provided you're not after long battery life in an ultraportable chassis. The Nile platform (2010) are 9W, 12W, 15W processors with DDR3 support. All these processors are Champlain processors with the new memory controller. Initial idle battery life testing is under way, and it's looking like 3.5 hours is going to be about right. Obviously, Internet and x264 will put a much bigger load on the system. 2.5 hours seems about what you'd get if the HD 5650 stayed active. Quirky system, though: I haven't found a way to disable the dGPU other than unplugging the laptop. I mean, sure, if you're plugged in having the GPU enabled is reasonable, but I do wish there were a way to manually engage/disable it. Also, the lack of AMD driver updates is disheartening... and there's not even an ATI CCC with the current drivers, so I'm not sure what version of the drivers it's running. hello. i'm the proud owner of an acer timeline 3820TG featuring an i5 540m and a switchable (manually) 5470 which i do not really need... but that is a different story. i read some reviews and they were complaining that you cannot turn off the discrete card when plugged in. that is not true and it's also not so obvious.